Invent Media is a Romanian fully privately owned company established in 2005. After about 6 years of experience in the field it takes pride in managing an impressive portfolio of clients renowned for their strict need for quality communication. The company's clients opted to promote both their image and products in the elevators included in the Invent Media's network (office buildings, for example). 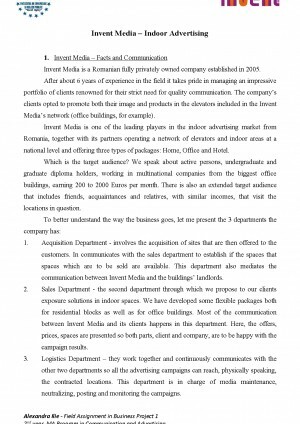 Invent Media is one of the leading players in the indoor advertising market from Romania, together with its partners operating a network of elevators and indoor areas at a national level and offering three types of packages: Home, Office and Hotel. Which is the target audience- We speak about active persons, undergraduate and graduate diploma holders, working in multinational companies from the biggest office buildings, earning 200 to 2000 Euros per month. There is also an extended target audience that includes friends, acquaintances and relatives, with similar incomes, that visit the locations in question. 1. Acquisition Department - involves the acquisition of sites that are then offered to the customers. In communicates with the sales department to establish if the spaces that spaces which are to be sold are available. This department also mediates the communication between Invent Media and the buildings' landlords. 2. Sales Department - the second department through which we propose to our clients exposure solutions in indoor spaces. We have developed some flexible packages both for residential blocks as well as for office buildings. Most of the communication between Invent Media and its clients happens in this department. Here, the offers, prices, spaces are presented so both parts, client and company, are to be happy with the campaign results. 3. Logistics Department - they work together and continuously communicates with the other two departments so all the advertising campaigns can reach, physically speaking, the contracted locations. This department is in charge of media maintenance, neutralizing, posting and monitoring the campaigns. 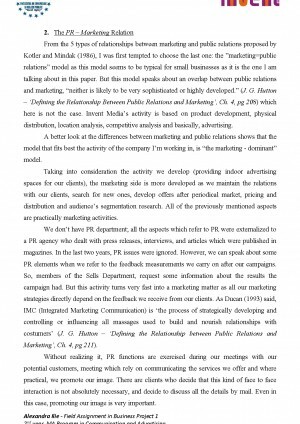 From the 5 types of relationships between marketing and public relations proposed by Kotler and Mindak (1986), I was first tempted to choose the last one: the "marketing=public relations" model as this model seems to be typical for small businesses as it is the one I am talking about in this paper. But this model speaks about an overlap between public relations and marketing, "neither is likely to be very sophisticated or highly developed." 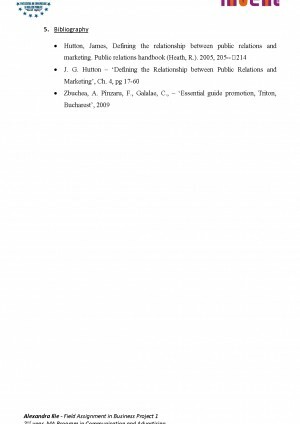 (J. G. Hutton - 'Defining the Relationship Between Public Relations and Marketing', Ch. 4, pg 208) which here is not the case. Invent Media's activity is based on product development, physical distribution, location analysis, competitive analysis and basically, advertising. A better look at the differences between marketing and public relations shows that the model that fits best the activity of the company I'm working in, is "the marketing - dominant" model. Taking into consideration the activity we develop (providing indoor advertising spaces for our clients), the marketing side is more developed as we maintain the relations with our clients, search for new ones, develop offers after periodical market, pricing and distribution and audience's segmentation research. All of the previously mentioned aspects are practically marketing activities. 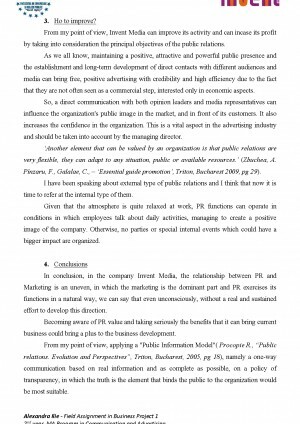 We don't have PR department; all the aspects which refer to PR were externalized to a PR agency who dealt with press releases, interviews, and articles which were published in magazines. In the last two years, PR issues were ignored. However, we can speak about some PR elements when we refer to the feedback measurements we carry on after our campaigns. So, members of the Sells Department, request some information about the results the campaign had. But this activity turns very fast into a marketing matter as all our marketing strategies directly depend on the feedback we receive from our clients. As Ducan (1993) said, IMC (Integrated Marketing Communication) is 'the process of strategically developing and controlling or influencing all massages used to build and nourish relationships with costumers' (J. G. Hutton - 'Defining the Relationship between Public Relations and Marketing', Ch. 4, pg 211). Descărcarea referatului cu titlul "The PR - Marketing Relation at Invent Media" este gratuită. Completezi informațiile din formularul de comandă și imediat după aceea vei primi prin email link-ul de descărcare.